Hand Made in Maine, some assembly required.. 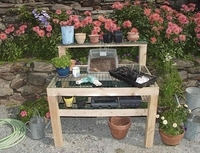 This sturdy potting bench is made from Northern White Ceder for a natural look. The Able Table uses the same wire mesh that is used in Lobster traps so that it can last through the years. It is a quality bench that is valuable to any gardener.